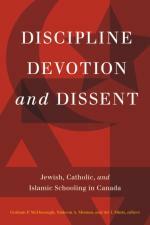 This December, Wilfrid Laurier University Press will publish Discipline, Devotion, and Dissent: Jewish, Catholic, and Islamic Schooling in Canada edited by Graham P. McDonough (University of Victoria), Nadeem A. Memon (Islamic Teacher Education Program and Wilfrid Laurier University), and Avi I. Mintz (University of Tulsa). The publisher’s description follows. The education provided by Canada’s faith-based schools is a subject of public, political, and scholarly controversy. As the population becomes more religiously diverse, the continued establishment and support of faith-based schools has reignited debates about whether they should be funded publicly and to what extent they threaten social cohesion. These discussions tend to occur without considering a fundamental question: How do faith-based schools envision and enact their educational missions?Discipline, Devotion, and Dissent offers responses to that question by examining a selection of Canada’s Jewish, Catholic, and Islamic schools. The daily reality of these schools is illuminated through essays that address the aims and practices that characterize these schools, how they prepare their students to become citizens of a multicultural Canada, and how they respond to dissent in the classroom. The essays in this book reveal that Canada’s faith-based schools sometimes succeed and sometimes struggle in bridging the demands of the faith and the need to create participating citizens of a multicultural society. Discussion surrounding faith-based schools in Canada would be enriched by a better understanding of the aims and practices of these schools, and this book provides a gateway to the subject.